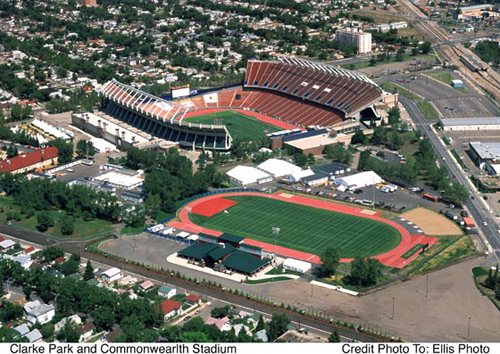 Built to host the 1978 Commonwealth Games, Commonwealth Stadium is conveniently situated less than one mile from downtown Edmonton, Alberta. Seating over 60,000 people, with ample space for food concessions, beverage sales, and souvenir stands, the stadium is the ideal venue for sports, entertainment, and much more! Home to the Edmonton Eskimos, the flagship franchise of the Canadian Football League, the stadium is no stranger to world-class events. In 1984 it played host to the Grey Cup, the CFL's Championship game. The stadium welcomed young athletes from around the world - in 1978 for the Commonwealth Games, and in 1983 to compete at the first North American held World University Games. In 1994 Commonwealth Stadium accommodated a sellout crowd for a magical World Cup Soccer match between Brazil and Canada. Commonwealth Stadium remains the only major sporting facility in Canada with natural turf, and is recognized as one of the premier playing surfaces in North America. This, combined with a three-story matrix scoreboard with instant replay and outstanding media facilities, makes the stadium an ideal spot to showcase sporting events. Spectators are awestruck by the wide-open feel of the stadium, where you can expect the stunning backdrops of clear blue skies or the fiery northern lights. Let's not forget entertainment! Over the years Commonwealth Stadium has become a major venue for concerts by such international stars as David Bowie, Willie Nelson, Genesis, Pink Floyd, and the Rolling Stones. Many of these performers have entertained sell-out crowds, including two Rolling Stones concerts that sold out in 49 minutes! In fact, Commonwealth Stadium was the top-grossing North American facility fo the week of October 3, 1994, when the Stones played to 122,000 fans. 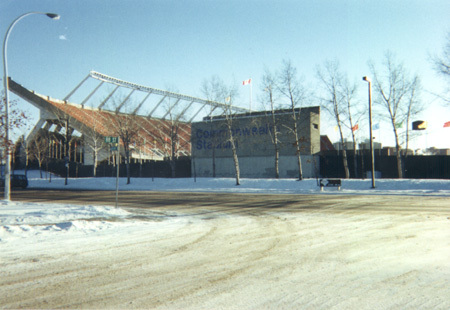 Commonwealth Stadium is situated 1.5 miles from the Edmonton City centre. The Stadium is served by the Light Rapid Transit (LRT) System and by normal Transit operations. During events of 20,000 or more spectators, the Stadium can be accessed by Transit's Park N'Ride service, normally operating from 4 or 5 locations around the city. The Stadium is easily accessed by private vehicle and taxi cabs. Access is from 112 Avenue or 86 Street from the North and from 107 Avenue and 92 Street from the South. There is on-site parking for up to 1,500 cars, event dependent. There is also adequate, secured parking for production and equipment vehicles. During events of 10,000 or more there is a parking restriction in place in the neighbourhoods surrounding the Stadium. Residents receive parking permits. Vehicles without valid permits will not be allowed to park for a 3 hour period beginning one hour before the start of the event. The restricted area is approximately within a 1.5 mile radius of the Stadium. The Edmonton Eskimos' biggest offseason "signing"? Sorry. None of the above. At $6.2 million Jumbo is way over the salary cap. But Hugh Campbell is convinced he'll sell tickets. "However big somebody thinks this might be, it's five times bigger," is how Campbell put it the day it was announced. "Attendance, I believe will be dramatically affected by it. Sponsorship will be dramatically affected by it." "We'll be able to do game production things we just couldn't do before. We can make the Eskimos experience much more fun." It is hoped Jumbo can be up and running on August 3, 1999 the start of the two-year countdown to Edmonton 2001, the eighth IAAF World Championships In Athletics. That would mean it would be up and running for the August 6th Eskimos' home game in Commonwealth Stadium and a total of seven of the nine regular-season Eskimo home games. The video scoreboard, which you can see under construction at the north end of Commonwealth Stadium tonight, is the world's largest 16:9 aspect ratio light-emitting diode outdoor Sony JumboTron. Also part of the package is an advanced lamp matrix board and sound system. The video board features 120-degree horizontal viewing angles. It also features short-colour compound distance of 12 metres so spectators can see the pictures from the seats directly under the board in the north end zone or from the top seat of the upper deck at the south end of the stadium. Toronto SkyDome has an old technology JumboTron. Air Canada Centre in Toronto has the new technology JumboTron board. The Commonwealth Stadium JumboTron is three times the size of the Air Canada Centre board. "It's the first outdoor screen in the world with this technology," says Rick LeLacheur, the CEO of the Edmonton 2001 project. The $6.2 million board represents the first legacy of the eighth World Championships In Athletics. Commonwealth Stadium will see further upgradings in the next two years, including planned corporate suites. Don Metz's highly respected Aquila Productions of Edmonton will put together the programming for the board, which will involve about 20 people on game day. Metz produces the show on the Edmonton Oilers' board in Skyreach Centre. "It's really the world's largest wide-screen outdoor colour TV. It essentially has four components. The first is a 41x24 foot video board. We'll be using lenses in the cameras which can put a full face on the scoreboard from any seat in the stadium." "It's going to be an entirely new experience. It'll add a whole new dimension. When the audio is in place, it'll be awesome." "After the 2001 event, this board will be portable. You can put it in and take it out. You can take it to City Hall, a Trappers game, Klondike Days, you name it. It'll take five hours to take down and put up again." "The matrix board will be a 28x24 board with 16 million colours. The combination of the two boards uses the entire space and casing from the old black and white board." "The project also involves a new sound system. The old one will be taken down and gutted and the new one will be installed in the same casing as well." Sony is contracted for the screen and video production broadcast booth, or course. Kimberlite Media International and Servtrotech Inc. have been contracted for the matrix board. Genesis Communications of Edmonton, the people who did the sound for the Windspear Music Centre, have been contracted for the P.A. system. Reprinted with Permission from the Edmonton Eskimos, whom we thank very much. The price of tickets to Commonwealth Stadium events will go up five percent starting next year to help pay for new seats, the Edmonton Journal said. The ticket tax approved by the Edmonton city council will add C$1 to C$2.50 to the cost of attending an Eskimos game, but will also be applied to other sports events and concerts, team president Rick LeLacheur told the newspaper. The Alberta city will spend C$12 million over the next three years replacing the stadium's 60,000 aging plastic seats, which are in poor condition and lack spare parts.